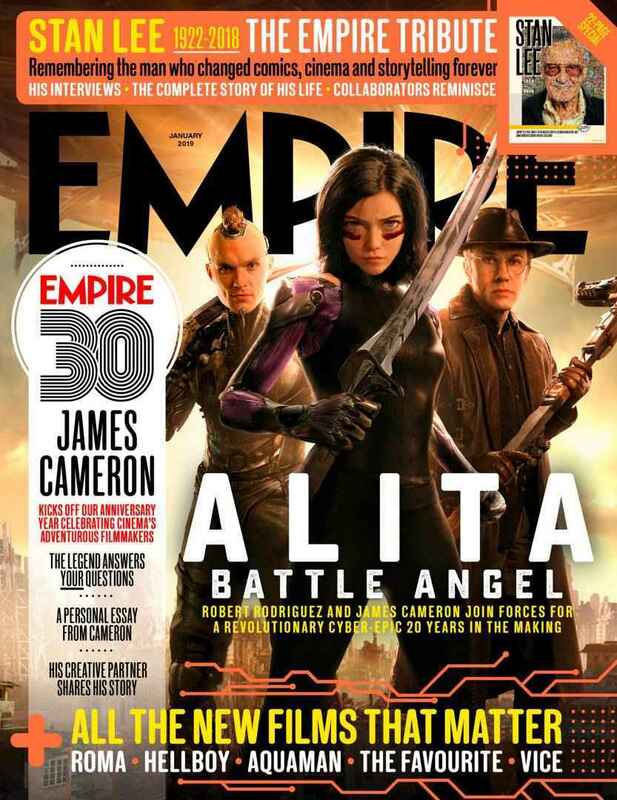 Alita: Battle Angel is featured on the cover of the January issue of Empire Magazine. The cover show Alita (Rosa Salazar) flanked by Dr. Dyson Ido (Christoph Waltz) and Zapan (Ed Skrein). In addition to Salazar, Waltz, and Skrein, the film also stars Jennifer Connelly, Mahershala Ali, Jackie Earle Haley, and Keean Johnson. Filming for Alita: Battle Angel began in Austin, Texas in October 2016, and wrapped in February 2017. The film was originally set to release in July 2018 but was delayed until December 21st, reportedly due to Cameron’s commitment to the Avatar sequels. The film was then pushed back again into February 2019, possibly due to the December 21st date being overcrowded with big-budget releases. Alita: Battle Angel is an adaptation of the popular, nine-volume cyberpunk manga Battle Angel Alita, created Yukito Kishiro in 1990. The series is set in the 26th century and follows a broken down cyborg, Alita, who is put back together by a cybernetics doctor. The doctor takes care of Alita, but the only memory she has of her past life is a mastery cyborg martial arts. She uses the skill to become a bounty hunter while trying to rediscover her past. Early looks a the film showed that technology had been used to create an “anime eyes” effect on the characters. The results were a bit offputting at first, but touch-ups to the film have toned the affect down to a less distracting level. Are you excited about Alita: Battle Angel? Let us know in the comments!